There are several changes going on with the Ho-Chunk Behavioral Health Division to better serve their clients. One change is that they are in a different facility. Behavioral Health is now in the main Ho-Chunk Clinic building to make it easier and more comfortable for people to seek services. The new location will allow patients to gain AODA and mental health services without the anxiety of being seen by people they know going into a separate building for the services. Before this move, Behavioral Health was at the former clinic building on the corner of Airport Road and Lumberjack Guy Road. Another change is in the process for accessing services for new as well as returning clients, which will speed up the procedure. “The process has changed beginning on January 1,” said Behavioral Health Division Director Evangeline Suquet. “It used to be that people would call the extension 5014 to request services at which time they would be scheduled for an Intake when the specialist does a brief screening to gather some basic information. At either the Black River Falls or the House of Wellness facility, this appointment could take up to two weeks. A counselor would then be assigned and it could take an additional two to four weeks before the client would be able to sit down with the counselor. With the changes, a screening form is filled out when the potential client calls and then the individual is assigned to a clinician immediately. Expediting any necessary referrals for the client. Depending on the clinician’s schedule, a person can get an appointment in seven to 10 days as opposed to six weeks with the former method, Suquet said. There are 27 staff members in the Behavioral Health Division that Suquet supervises with a clinical staff of 16 who meet with clients. Behavioral Health staff are developing support groups within the division. Currently, there are the Fatherhood is Sacred, Motherhood is Sacred, Healthy Relationships, and Substance Abuse groups. “There is some interest in offering support groups to members of the public other than clients. Under consideration are the Fatherhood is Sacred and Motherhood is Sacred groups. They would be considered education sessions and community events. These would need to be separate from client groups because of HIPPA regulations,” Suquet said. These groups are held in the Clinic Classroom and now evening groups are now being offered since many people often work during the day. In anticipation of possible emergencies, a crisis counselor is available on a daily basis each weekday and people are welcome to call or walk in during those situations. In February 2018, the division underwent a reorganization. Terry Greendeer, the former director, stepped down and Evangeline Suquet took over her duties as division director. Although people still are calling and asking for Terry, the correct information of the new leadership is identified and the community member is directed to the appropriate contact. Because of staff turnover, in addition to the transition into the clinic, scheduling has become an issue. For scheduling purposes, community members are asked to continue to call the Behavioral Health (extension 5014), which goes into Suquet’s voicemail resulting in calls being forwarded to the Crisis Counselor for follow up. Consequently, if the Crisis Counselor were unavailable, Suquet would spend much time calling them back and addressing their concerns. They hope to alleviate some of that burden by adding another staff member. Whitney Sanchez has recently been added to the staff at Behavioral Health as a Clinic Office Manager. She will be responsible for many tasks and processes. 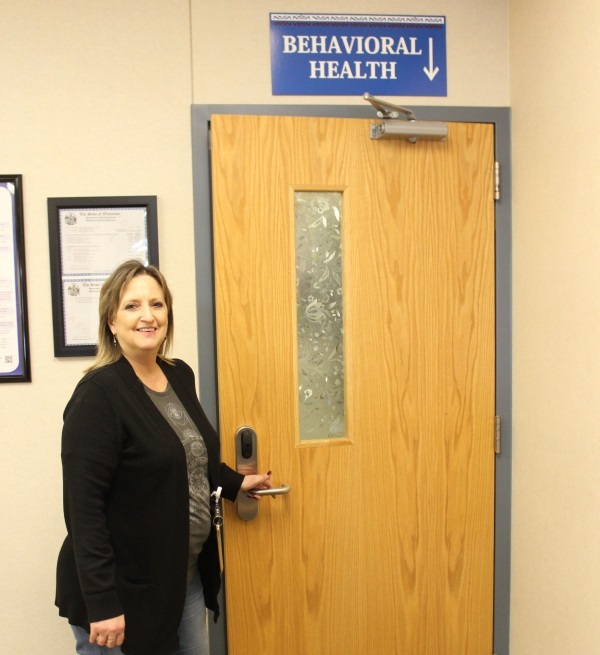 As of January 14, Diane Littel was hired as the Behavioral Health Program Manager. She is a certified in EMDR, aromatherapy, an experienced clinician, still seeing clients at Nekoosa as well as BRF until we can find a replacement for the Nekoosa Health Office. There will be a vacancy in Nekoosa, which will be posted. The volume of patients have been increasing over the years, Suquet said. “We’ve experienced an increased volume, especially because of the ongoing opiate crisis,” she said. In addition to the in-house duties, the staff goes to the hospital to offer assessments and to begin the treatment process in a more timely fashion. The need for treating inmates is a real concern because often people commit crimes due to AODA or mental health issues. The Behavioral Health Division staff also complete assessments at the jails to coordinate any or all necessary services.